More of an introduction and then a couple questions.. So, i've been using linux since fedora core 6. I'm 21 years old, and currently a student in berkeley, studying for my certification in ethical hacking, and penetration testing of networks. 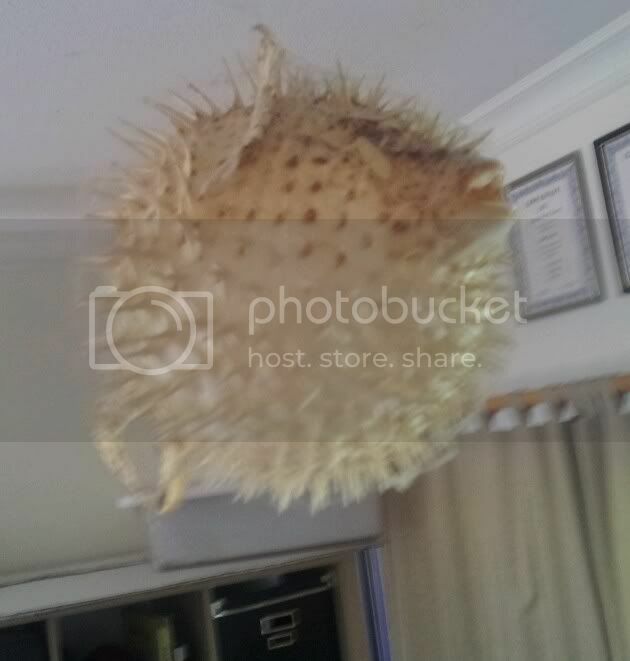 I , in fact have a real pufferfish skeleton hanging from my ceiling(HE LOOKS LIKE PUFFY!) I feel as if, the pufferfish ive had my whole life has been telling me. "OPENBSD IS THE RIGHT CHOICE!" I remember using openbsd when it was at version 4.8. I've decided, that, as a security professional in the making. I should make the swap to UNIX, that and to get in touch with my Unix roots. That being said, i have a few projects im working on. First is a very simple script that will be executed after installation and setup exactly what i want. When i tried at school, my wildcard function wasnt working. You might say, why not use backtrack? But, backtrack isnt supported on so many ranges of old hardware, one of my fetishes is bringing old old computers back to life, and making them work. As servers, or whatever. Ill make another post about a laptop i would like to be using, but thats a different thread. In addition to a script that pulls everything from the internet, i would like to have something that rips all of the packages from the cd that im going to make, incase the computer doesnt have LAN connection. I know how to get the packages, but how would i make sure all the dependencies are there? i also plan on buying the absolute openbsd book and ssh mastery! You might want to consider coming up with the scripts to customize installation/upgrading. Studying Section 4.14 of the FAQ is a start. Threads can be found on the topic as well. eg. ...how would i make sure all the dependencies are there? Look at the print-build-depends & print-run-depends targets in the ports(7) manpage. Hi 0xicl33n !! Welcome to the amazing world of BSD !! since you're from a *NIX background you will feel at home when working with OpenBSD .. this great OS is literally the best world I've happened to enter .. still a newb in the strictest sense of newbieness , OpenBSD appeal to me as it utterly does , more particularly to nerds, hackers , kernel miners, zen seekers .. one thing is sure: the more you use it , the more you love it .. I'm creeping forward like a snail .. ya but I don't think I'll move to any other OS .. Welcome mate ! Enjoy ! ... how would i make sure all the dependencies are there? I once needed to do this too. The solution I stumbled upon was, that once you have a package, you can grep the +CONTENTS file for ^@depend. And recurse. I don't know if this is the best way but it worked for me at the time.